What does a copywriter do? What’s the hardest part of being a copywriter? What are the copywriting tips to write a great copy? What mistakes to avoid? An interview with a copywriter Rob Philbin. What’s your passion? If you are lucky, it’s what you do for a living. If you are less fortunate, it’s just a hobby. Is it painting? Running marathons? Breeding penguins? Not the penguins? Then I give up. But IF you have a passion, I know one thing for sure: you are constantly trying to get better. You want your paintings to be displayed in the galleries they bring school kids to for an excursion. You want to be the next winner of the Iron Man. I’m passionate about writing. And I am, too, constantly trying to improve. I used to read articles over articles, clicking on each and every link that started with “tips and tricks” and “how to”. I don’t do it anymore. Because it’s a time waste. Because 90% of such articles are chewing on the same 10 points, which are, in addition, either trivial or useless. My “favorite” piece of advice from this pool of wisdom is Write Awesome Content. Brilliant! Where do I call to sign up this treasure for the “Best Advice of All Times” competition? Together with its evil twins Keep It Short and Make It Longer. These articles do make you feel like breeding penguins would be easier. and Rob Philbin, somebody I met by accident, and who, by no accident at all, knows a great deal about writing. In one of my posts on Google Plus, I complained about having troubles with a blog post I was writing. Next thing I knew, Rob offered me to have a look at my piece and to give me his honest feedback. On his own time. For free. I sent him my piece, and a week later I received a document full of detailed comments. One of the most helpful feedback rounds I could wish for. This moment I knew there was more where it came from. This knowledge had to be shared with everybody else who is looking for helpful — specific and detailed — advice on writing. Meet Rob Philbin, a trained and skilful (copy)writer, who kindly agreed to answer more of my (never ending) questions about writing (and life), this time in public. Please prepare your pens and paper to take notes. Or at least get your printer and a fat yellow marker ready. Because you will now read things you will “deffo” want to remember. * On a side note: I hope you guys realize how brave it is of me to write about and interview a person who probably knows at least 3 different ways to improve my every sentence. And no, I’m not going to tell you how many times I re-wrote this introduction. Gill: I’ve heard the word a couple of times here and there before and I used to wonder, “What do these mysterious people do?” I couldn’t quite connect the “copying” and the “writing” and used to call them “copy-paste-writers” in my head. After I met you, I finally googled it, so now I have a better idea. But I’d rather let you tell us yourself. So what does a copywriter do exactly? Rob: John Kennedy describes copywriting as “salesmanship in print”. I can’t beat that. We’re hired to write “copy” that encourages readers to take some sort of action. Most of what I do is online (landing pages, blogs, emails). But many copywriters turn their hand to magazine ads, YouTube scripts, TV ads and much more. Gill: Is copywriting a new phenomenon? When did it start? Who were the “first copywriters”? Rob: Great question. Copywriting started ages ago, but it seemed to take off in the Roaring Twenties. The dead copywriters like Claude Hopkins and David Ogilvy are considered the first “greats”. I’m honestly not sure who was rocking it before Claude. Gill: How long have you been a copywriter? Rob: About three and a half years now. Gill: But you studied imaginative writing, right? Was this degree a conscious choice, because your father is a writer? Rob: Yes, definitely. In all honesty, I picked that degree over journalism, because I figured my dad could help me out. He did. And things worked out well over the the three-year course. Nice one, Dad. Gill: What were you initially planning to do with this degree? Rob: (laughs) I had no idea. I remember the lecturer asking me that same question… right after telling me there is no money in writing short fiction or poetry. Gulp. Gill: How did you start your copywriting career? Was it a lucky incident or did you after some time realize that it’s what you wanted to do yourself? Rob: About a month before graduation, I googled “what jobs can I get as a writer?” and panicked. I’d never even heard the word “copywriter” before, but I liked the idea of it. Turns out, an agency called PH Creative was hiring for a sports writer for their client The Mersey Tigers (Liverpool’s pro basketball team). I sent them an email pitch, and they told me I’d be a perfect match for the role. Then I heard nothing from them for about two weeks. So, paranoid, I decided to draft up an example piece of content for the club’s upcoming game against Newcastle Eagles. Turns out, PH Creative had handed over the contract to JDG Media. Long story short, my piece landed on the table of James Gordon, who was the founder. He loved it and even published it in the programme. I started volunteering at JDG the following week. It was mainly sports journalism, but when the copywriting work came through, I signed up and really enjoyed it. After about nine months I applied for Latitude. All my experience with JDG got me through the interview, and that’s how it all started. When I need inspiration, I read. I go to my books or the copywriters I admire online and I dig into their archive of posts. Gill: Which piece are you most proud of? Rob: That very first piece that was published by James in the programme for the Mersey Tigers. Everything in my career started with that. It’s still framed in my mum and dad’s house. Gill: Which piece are you least proud of? Rob: Hm. I’ve certainly written for some questionable industries. Hard to pinpoint one piece. Probably something I’ve written for a payday loans company back in the day. Gill: Ok, I see you are not going to give us a link here, so I’ll rephrase: What do you do if you don’t like the product or brand you need to write a piece of copy for? Rob: I politely email the client explaining they are a disgrace. Then I stop daydreaming, remain deep inside my shell, realise they’re paying me good money… and do my very best. Gill: What do you do when you badly need inspiration, but it’s not coming? How do you give your creativity a boost? Rob: Boring answer here … I read. I go to my books or the copywriters I admire online and I dig into their archive of posts. I read the headlines. I read the intros. And I study the layouts. If I stare at this pond for long enough, I usually see some inspiration in the reflection at some point. Gill: Is there something that you’ve learned over the years you wish you knew when you just started? Rob: Deffo — I wish I knew that simple writing is much more effective than “clever” writing. I was like most graduates — trying to impress with long words and elaborate metaphors in the beginning. Yawn. Nobody wants to read that stuff. Especially online readers. Rob: (laughs) It depends on your audience. But in general, people often want fast, simple, useful and/or entertaining information. You won’t see any mainstream magazines using complicated words and essay-like conclusions — so it deffo makes sense to keep it simple online, too. Never lie. Readers can see through your BS in a New York minute. Gill: What are the most common mistakes you can do while writing copy? Rob: There are so many. And I’ve made them ALL (I’m still making some of them). I’ll try and choose a Top 3. 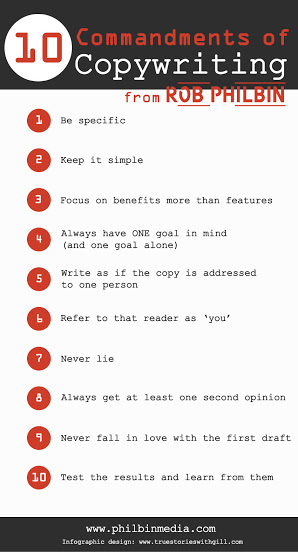 Gill: Are there something like “10 commandments of a great piece of copy” — something that is a “must” in copywriting? What would be your personal copywriting tips? 1. Be specific. A “powerful” Jaguar is less appealing than a Jag with a V8 engine that hits 60 in 5.5 seconds. 2. Keep it simple. Clever readers will always understand simple language. Those with an average education may struggle to understand clever language. You’re better off appealing to both crowds — and the smart people won’t be offended. Well, they shouldn’t be. 3. Focus on benefits more than features. The benefit of life insurance is that you get peace of mind that your family will be okay if you kick the bucket. The feature of life insurance is a tailored payment plan to make sure your family is paid when you die. Both are important, but the former is more appealing. 4. Always have ONE goal in mind (and one goal alone). Do you hate it when the menu’s too big in a restaurant? Imagine, the chef already knew what dish you wanted and presented it as the only option. Easy. Too many options can confuse your reader into indecision. 5. Write as if the copy is addressed to one person. It’s more personal this way. A much nicer experience for the reader. 6. Refer to that reader as “you”. This is “salesmanship in print”. And I’d always ignore a salesman if he referred to me as “the customer”. 8. Always get at least one second opinion. Get it from someone who will call you out on any crap. This can also help reassure you that you’re doing well — it works both ways. 9. Never fall in love with a first draft. If you’re doing number eight, then do it with an open mind and avoid defending your first draft to the death. 10. Test the results and learn from them. It’s the best way to improve. Gill: That’s a lot of things to keep in mind! When you are writing, do you then consciously check whether your copy fulfills all the “10 commandments”? Rob: (laughs) Well, until now I had never laid them out as a series of commandments! It becomes your second nature after a while. But I’d recommend referring back to printed out guides all the time. I often pick up John Caples’ “Tested Advertising Methods” when writing a headline. The hardest part of it is cutting the cord on every piece of work. Writers are writers — and it’s hard not to get attached to your words. Gill: How do you measure the success of a piece? Is it all about number of likes and shares? Rob: That’s the BIG question, Gill. I’ll try to keep the answer small. It goes much deeper than “vanity metrics” like Facebook likes and +1s. Total visits, unique visitors, time on page — every user’s interaction with a piece of copy can be measured online through analytics. Again, if the copy has one goal like it should — and it can be as simple as prompting a retweet — then that goal can be identified in Google Analytics. You’d then measure how many visitors went on to complete the goal, and this would determine the effectiveness of the copy. I’m still very much an analytics newbie. Luckily, the agency I work for offers some good training on that side of things. 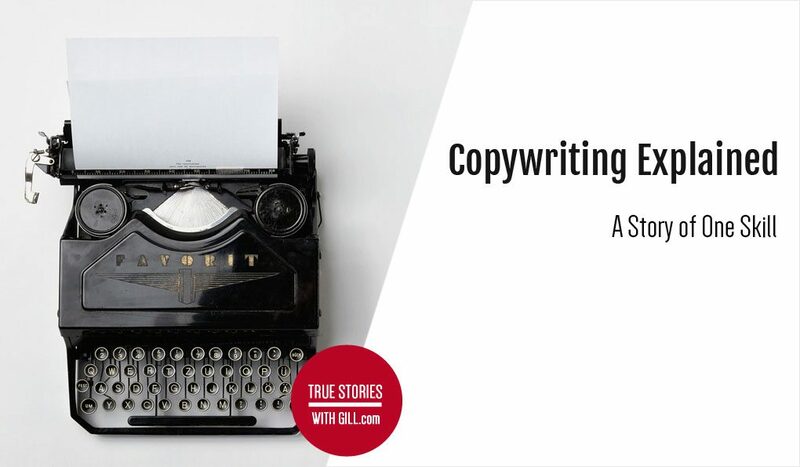 Gill: What’s the hardest part of being a copywriter? Rob: Cutting the cord on every piece of work. Writers are writers — and it’s hard not to get attached to your words. But spend too much time mothering the copy, and you never get anything done. I always get stuck on choosing a headline. 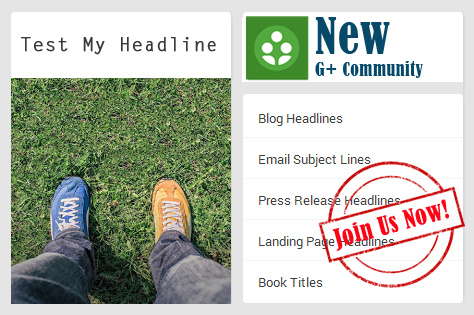 Which is how the idea for our headline testing community on G+ came about. More people should get involved with that by the way. Gill: Oh right, the Test Your Headline Community! The idea behind it is very simple, but yet brilliant, I think. Imagine, you are stuck choosing a headline for a post or an email. You wish you would know what would resonate better with the readers or the recipients. Guess what? In Test Your Headline Community you can do exactly this: test your headline with potential readers and get constructive feedback. All you need to do is to make a post in this community and put two different comments under that post containing a headline version each. The members of the community will then “vote” for a headline they like better by plussing the respective comment. I’ve never seen the ratio between the effort it takes to give feedback and the value of this feedback to be so high! Also, this is fun for everybody, writers and non-writers alike. Sorry, what were we talking about (laughs)? Right, you. And copywriting. So what’s the most fun part in being a copywriter? Rob: (laughs) Nice plug. And I agree. The most fun part? I guess it’s realising that you get paid to write. That’s a big deal in the beginning, and it feels good every time you remember it. Gill: Does your writing have personal traits, i.e. words and structures that are typical for your work, so that if I knew about them I could say, “ah, this piece must be from Rob”? Rob: (laughs) People often point out my layout and one-line paragraphs as my “style”. But if you just go read Demian Farnworth’s blog, you’ll see how he’s influenced that style in a big way. As for anything else, I’m not sure. I’m often shackled to the tone of voice guidelines from big brands, so it’s difficult to add too much of my own flavour. That said, you’ll see local slang in my personal writing all the time, which might give it away. Want to know whether you have what it takes to be a (copy)writer? Volunteer. Gill: You have a full time job, a blog and a baby. And playing computer games is still listed as your hobby. How do you manage your time to get everything done? I don’t! I neglect the blog all the time and hardly get a sniff on the Xbox these days. But my best tip for time management is to get up at 5 a.m. I always fall asleep on the couch around 9 p.m., but it’s usually a productive day for me if I’m up before sunrise. Gill: Has becoming a dad influenced your writing style? Rob: I noticed this last week actually — a lot more parental references are slipping into my copy. You get a much better view on the world from the throne of parenthood. And the slobber on your t-shirt is worth that perspective. Rob: (laughs) Who knows? I just hope people see me as a good dad more than anything else. Copywriting is definitely my passion right now. And I’ve still got plenty to learn. Ask me again next year! Gill: (laughs) Maybe I will! I did promise the never ending questions. But I think I used too much of your time already. This will be hands down the longest post on my blog. I tried to “keep it short”, but I found it impossible to make it shorter than this. It’s just way too interesting. So here comes my last question (for now): What advice would you give somebody who thinks they could be a (copy)writer, but are not sure whether they have what it takes? How do you know you have what it takes? Rob: Volunteer. Find somebody you want to work for and offer your writing skills for free. Expect to fail. And never take it personal when you get negative feedback. The stakes are low when you volunteer, but high enough to give you a sense of the front-line. Meanwhile, read anything you can by John Carlton. He’s pretty much the drill sergeant of the copywriting world. He’ll soon let you know if you have what it takes. Next post How to Keep Your Mind Healthy. A Story of One Calling. My pleasure, dear Yukta 🙂 Do check Rob’s site. You’ll find more great tips on writing there. Yeah sure.. I need it. 🙂 😀 Thanks a lot. This is a great article. Lots of gems on the arcane art of writing penetrating copy. Rob will deny it, but he’s a master. Thanks for putting this together, Gill. Thanks, Donnie! You are right, he is and he will totlly deny it! 😀 I’ve learned so much myself!